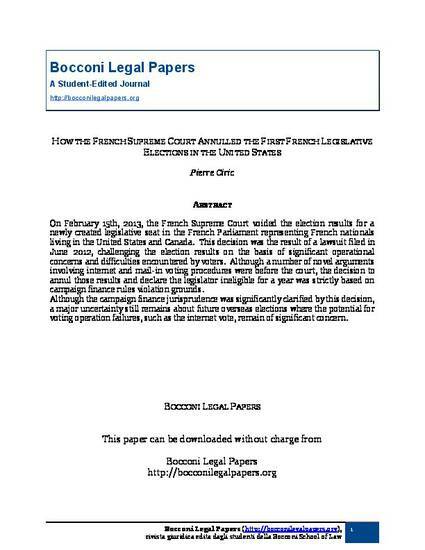 On February 15th, 2013, the French Supreme Court voided the election results for a newly created legislative seat in the French Parliament representing French nationals living in the United States and Canada. This decision was the result of a lawsuit filed in June 2012, challenging the election results on the basis of significant operational concerns and difficulties encountered by voters. Although a number of novel arguments involving internet and mail-in voting procedures were before the court, the decision to annul those results and declare the legislator ineligible for a year was strictly based on campaign finance rules violation grounds. Although the campaign finance jurisprudence was significantly clarified by this decision, a major uncertainty still remains about future overseas elections where the potential for voting operation failures, such as the internet vote, remain of significant concern.